Virginia Kantra. Carolina Girl. New York: Berkley Sensation, 2013. Meg Fletcher is just getting back to the office in Manhattan after spending time with her family in their moment of need. The matriarch of the Fletcher family, Tess, was in a car accident with a drunk driver and the Fletchers rallied together in order to get things done. Meg doesn’t usually take time off from her job. But her mother was in the hospital and family has always been important to the Fletchers. In a Marine household, you learn how to stick together in order to deal with the constant moving. When you’re always the new kids in town, your siblings are your closest friends. Meg might have enjoyed being with the family on Dare Island, her family’s home for generations, but she is glad to get back to Manhattan, her job, and her long-term boyfriend and roommate Derek. However, the return isn’t anything like Meg expected. Meg is fired on her first day back at her job of twelve years. Derek works for the same company but his job is secure. Convincing herself that it wouldn’t have been professional for Derek to stick up for her, Meg still expects him to come home early that night to comfort her. When Derek comes home even later than usual and starts talking about taking some time apart to think, Meg heads back to Dare Island. When Meg is picked up by her high-school crush–and brother Matt’s best friend–Sam Grady, she feels familiar stirrings in her heart, but she won’t make that mistake again. They shared one night of passion as teens and then he made sure to avoid her. What a jerk! Yet, she soon finds herself confiding in him. Also, when her mother’s accident threatens to cause them to lose Taylor–the niece that no one knew about until Taylor’s mother died–Sam does everything he can to help. Maybe he isn’t the boy he used to be. But, that doesn’t mean anything can happen between them. Meg still has Derek to think about, and she’s definitely not giving up life in New York for an island she dreamed of escaping all her youth. Carolina Girl is the second book in the Dare Island series. The first title in the series Carolina Home told the tale of her brother Matt, who stayed home on Dare Island. The third book in the series, Carolina Man, continues on with the siblings, telling the story of Luke, a Marine like their father. In Carolina Girl, we get the story of the family’s only girl, and readers grow ever closer to this North Carolina family and the values they live by. 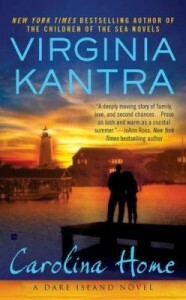 Virginia Kantra. Carolina Man. New York: Berkley Sensation, 2014. Luke Fletcher is a Marine serving in Afghanistan when he receives a call from Kate Nolan, a small-town lawyer. The call is to inform Luke that an ex-girlfriend from high school, Dawn Simpson, has died. Dawn left behind a ten-year old daughter, Taylor. Luke has been named as Taylor’s father and also her guardian in case something happens to Dawn. Luke must return home to Dare Island on North Carolina’s Outer Banks to take on this new responsibility. 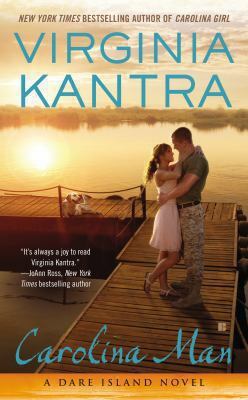 In his quest to do what’s right, Luke finds himself falling for both his little girl and the intelligent but damaged Kate, who is a former military brat herself and doubts the ability of a Marine to make a good father. Luke will have to discover that serving his loved ones can be just as gratifying and heroic as serving his country, and that it may take just as much skill. The only roadblock to this discovery is the Simpsons, Taylor’s maternal grandparents and their son Kevin. The Simpsons are fighting for custody of Taylor even though she has expressed her desire to stay with her father and his family. When the Simpsons make a step towards being amicable, the Fletchers will discover what’s behind Taylor’s vehement declaration that she will not go back to them. 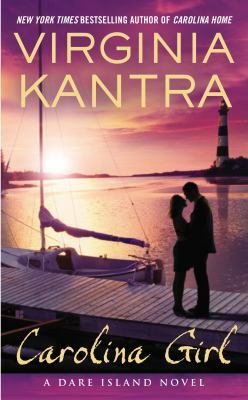 Carolina Man is the third book in Kantra’s Dare Island series focused on family, community, and love. The first two novels told the tales of Luke’s older brother and sister. Will Luke be able to find the peace his siblings have gained? Will he have what it takes to be a hero on the home front? Virginia Kantra. Home before Midnight. New York: Berkley Sensation, 2006. It’s a cliche, but it’s still as true as the day Thomas Wolfe wrote it: You can’t go home again. Or, if you do, watch out! Paul Ellis is the author of best-selling true crime books. When he decides to write about a 1987 triple murder in Stokesville, North Carolina, Ellis and his wife move back to her family home in the town. As luck would have it, his research assistant, Bailey Wells, is also a Stokesville girl. Bailey is reluctant to return to Stokesville, but Ellis is both an employer and a mentor to her, and she may be in love with him. When Mrs. Ellis is murdered, the local police settle on Bailey as the prime suspect. While the police want to wrap this case up quickly to avoid bad publicity, the lead detective, Steve Burke, is torn between duty and his attraction to Bailey. As the evidence mounts that Mrs. Ellis’s murder may have some connection to the slayings in 1987, the body count rises.